POLITICAL TIDBITS: Dengvaxia hysteria triggers fear of all inoculations, in fact even of deworming, lament medical practitioners in full-page ads. Investigation of this anomaly ought to result in court charges. President Duterte should not ignore growing antagonism of UP students. Dengvaxia hysteria triggers fear of all inoculations, in fact even of deworming, lament medical practitioners in full-page ads. Investigation of this anomaly ought to result in court charges. President Duterte should not ignore growing antagonism of UP students. Yesterday, February 06, some 200 of this country’s most prominent medical practitioners as well as a few other concerned professionals lent their names to a full-page statement published in leading newspapers, titled “Statement on the Dengvaxia Controversy.” The professionals denounced the confusion and hysteria over the reliability and integrity of the Dengvaxia vaccine as well as the unfortunate attacks on the integrity of some professionals involved in its study and implementation. The signatories wholeheartedly supported the suspension by the DOH of the Dengvaxia program implementation, pending full-blown investigation and accountability of this mess. To my mind, however, the most significant point that the medical practitioners stressed is their justifiable concern about how the death of some children, supposedly attributed to Dengvaxia, has brought up what could be A MORE DISASTROUS CONSEQUENCE. This is the fear spreading especially among lower-income families about all kinds of vaccine inoculations---so that there is now a palpable resistance to them where there was none before. The medical professionals asserted in their full-page ad a very crucial point that was also raised earlier by Dante Jimenez of the Volunteers against Crime and Corruption when he guested in the dzRH Sunday 6pm. program that Cecile Alvarez and I co-hosted a week ago. Jimenez stressed the fear of the medical community that because of the disinformation/misinformation and mass hysteria “that is allowed to rule over logical and scientific judgment” in the Dengvaxia case, other vaccination programs of DOH have also become suspect. In fact, parents are now afraid even of de-worming. The medical professionals are validly apprehensive that as a result of the prevailing fear about Dengvaxia’s ill effects, many parents are now afraid of “the (other) life-saving vaccines that our government gives.” The parents’ refusal could lead to “outbreaks of debilitating and life-threatening diseases that we have already been able to control through our vaccination programs,” said the medics. In other words, epidemics. If you ask me, this situation whereby the trust of parents in the government inoculation program has suffered is MOST SERIOUS AND ITS REPERCUSSIONS ON PUBLIC HEALTH CANNOT BE OVER-ESTIMATED. Thus, it is imperative that those officials in the previous administration who caused this Dengvaxia mess through sloppy diligence---and it’s almost inevitable to conclude---their eagerness to raise campaign funds through possible kickbacks from the P3.6 billion vaccines---be brought to justice. I was in Hongkong in 1997, during its handover by Great Britain, represented by Gov. Chris Patten, the last British governor of colonial Hongkong; it subsequently became a special autonomous region (SAR). Prince Charles represented the British Royal Family in the ceremonies and I remember feeling strangely sentimental when the royal yacht “Britannia” carrying Charles blew its horn for the last time in Hongkong Harbor before sailing away. Fireworks displays burst in the skies afterwards. Patten’s observations about the failing check and balance system in the US raise some similarity with our system here. President Duterte, a most forceful leader, has been at odds with Ombudsman Conchita Carpio Morales, and this came to a climax when he ordered Overall Deputy Ombudsman Melchor Arthur Carandang placed on 90-day suspension---after he started probing the President’s alleged unexplained wealth, in response to Sen. Antonio Trillanes’ petition for this probe. The feisty Morales refused to suspend her deputy, citing the “clear affront to the Supreme Court” which made a ruling last Jan. 28, 2014 declaring as unconstitutional the Ombudsman Act’s provision that gave the Office of the President disciplinary powers over the Ombudsman’s deputies. Corollary to this was the advice recently given by Mr. Duterte to Myanmar leader Aung San Suu Kyi in New Delhi, to ignore criticisms from human rights groups over her government’s treatment of the Rohingya Muslims. This "advice" was unfortunate as it only reinforced the President’s assailable reputation on human rights. 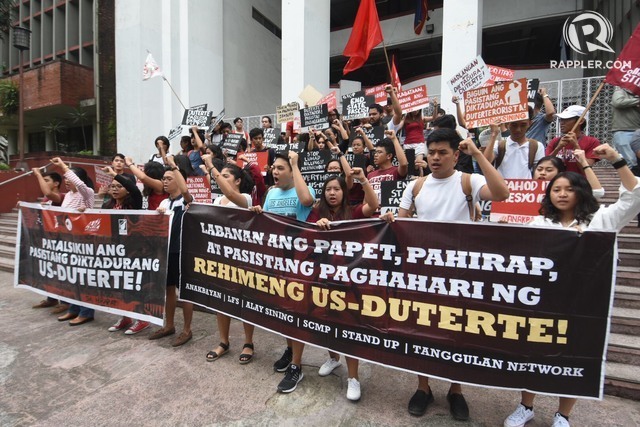 Then too, Mr. Duterte reacted badly to the protests of the UP students in Diliman over human rights violations in recent weeks (doesn’t he realize that UP students throughout history have always been in protest of one issue or another). Because of his pique, he has threatened to replace the protesters with lumad students, which has only riled up Diliman even more. A big protest is scheduled by a campus political party called “Student Alliance for the Advancement of Democratic Rights” (STAND UP) on Friday, Feb. 23 in Diliman where the students would insist that it should be Mr. Duterte who should vacate his position, not them.